TCCoA Forums > Other Stuff > Ford TCCOA HomePage News > Ford to counter GM's new trucks by offering peek at 2015 F-150 in Detroit? 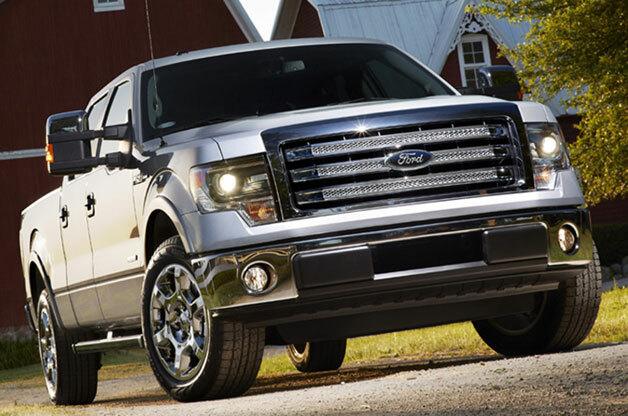 Ford to counter GM's new trucks by offering peek at 2015 F-150 in Detroit? With the Ram 1500, Chevrolet Silverado and GMC Sierra all getting major upgrades recently, there has also been plenty of speculation how Ford will respond as it looks to maintain its title as America's best-selling truck. Last week, Automotive News reported that Ford is looking to make a significant fuel economy gain with its 2015 F-150, and now Reuters is saying that the automaker will be offering some sort of peek at the new truck at next month's Detroit Auto Show. The report seems to indicate that Ford might have a concept vehicle on display at the show, but when Autoblog reached out to the Blue Oval for comment, Mike Levine, Ford's truck communications manager, told us "we're highlighting our all-new global lineup of commercial vehicles at NAIAS, including the Transit and Transit Connect vans. We have no other news to announce at this time." Thus, Ford could be showing absolutely nothing related to its F-Series future, or it might clandestinely slip something onto its display - a rendering, perhaps, a cutaway vehicle, a technology display, a concept, or perhaps a full-blown production vehicle, although the latter strikes us as highly unlikely given how far away the new production model actually figures to be. All reports do seem to point to the fact that the next F-150, which could debut in late 2014 for the 2015 model year, will feature extensive use of aluminum body panels to help shave more than 700 pounds from its curb weight in order to help improve fuel economy by as much as 20 percent.Ford to counter GM's new trucks by offering peek at 2015 F-150 in Detroit? originally appeared on Autoblog on Mon, 17 Dec 2012 13:16:00 EST. Please see our terms for use of feeds.